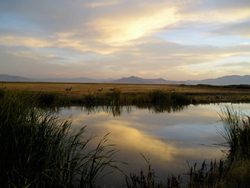 Bear River Migratory Bird Refuge in northern Utah at dawn. Photo copyright 2008, Jeff Rice. All rights reserved. Used with permission. This month D-Lib's featured collection is the Western Soundscape Archive, University of Utah. World Library and Information Congress: Satellite Pre-conference, 19 - 20 August 2009, Florence, Italy Call for papers. The submission deadline is 1 December 2008. Laura Bush 21st Century Librarian Grant Applications. Call for applications. The submission deadline is 15 December 2008. World Library and Information Congress: 75th IFLA General Conference and Council: Libraries create futures: Building on cultural heritage, 23 - 27 August 2009, Milan, Italy. Call for papers. The submission deadline is 15 December 2008. Archiving 2009, 4 - 7 May 2009, Arlington, Virginia, USA. Call for papers. The submission deadline is 21 December 2008. 2009 ISPIM Conference - The Future of Innovation, 21 - 23 June 2009, Vienna, Austria. Call for papers. The submission deadline for outlines is 31 December 2008. Reference and User Services Association. Call for papers for the RUSA meeting at the ALA Annual Meeting 2009. The submission deadline is 5 January 2009. Joint Conference on Digital Libraries (JCDL) 2009, 15 - 19 June 2009, Austin, Texas, USA. Call for papers. The submission deadline is 23 January 2009. 6th International Conference on Informatics in Control, Automation and Robotics (ICINCO 2009), 2 - 5 July 2009, Milan, Italy. Call for papers. The submission deadline is 30 January 2009. 4th International Digital Curation Conference "Radical Sharing: Transforming Science?"